The novel is the writer's equivalent of movies, yet there seems no writer’s equivalent of the TV series outside of Reader’s Digest serialized stories, and this seems limiting. Sure, there is the screenplay for a series, but this leaves a lot to be desired after the director has scribbled all over it and spilled coffee on the cover. In any story it’s important to know what the words mean. If Aleister Crowley says “Let’s do some magic”, it’s not at all the same thing as if a guy who pulls rabbits out of hats says it. Confusing the two could lead to serious mistakes, especially if you happen to be fond of rabbits. If John Williams says, “Give us an E”, it means the one below middle C; if Liam Gallagher says it, it means a small tablet out of his jacket pocket. People get their own ideas of what words mean, according to their own social context and previous experience, and some of the most difficult words we’re going to have to deal with in this story are those with multiple meanings to many different people. Words like “intelligence”, “emotion”, “morality”, “interaction”, and “love”. You may think that everybody understands such words; they’re used all the time in everyday communication. In fact, they all have many interpretations. This is an important thing to realize, because to follow the path Beyond the Porcelain Throne, we have to understand exactly what is meant by all of them in the context of Reality. So for the purpose of this story, we have to agree on very specific meanings for our words, or it won’t work, okay? First though, we’re going to use a not-so-well-known word, and that is “entelechy”. Because it is not well known, we can be reasonably sure of no multiple meanings and so no confusion. The Greeks [or possibly, the Geeks] invented the word ‘entelechy’. Literally, it means a process of bringing towards actualisation of any given thing; bringing an idea into realization, thinking of a song and then playing it on an instrument, inventing a thing and then building it, desiring a skill and then learning it...but entelechy is an ongoing process of development. It never ends. You can look upon the development of life on Earth as entelechy. From the lowliest life forms like bacteria, to the great apes, life constantly appears to strive for ever more complex expressions of itself, more abilities, more potential to adapt, survive and thrive. Entelechy is a natural force like gravity; it appears throughout nature, and it is the exact opposite of entropy. Both are needed; in this silent dance that we know as life, it’s very important that things are broken down and destroyed, or you couldn’t digest your dinner. You recycle those nutrients to build muscles and bones and brains and kidneys and things, so destruction and recycling are just as important to life as is entelechy. That’s the first important lesson in this story –‘Destruction’ Can be a Good Thing. This whole process is called, by people in white coats who peer down microscopes, ‘anabolism’ and ‘catabolism’. Anabolism constructs things, and so it needs energy to do that. Catabolism breaks things down, and it gives off energy so that’s very convenient. But we’re not here to do a science lesson; we’re here to have a laugh. For now, all we need to know, is that’s what entelechy means. 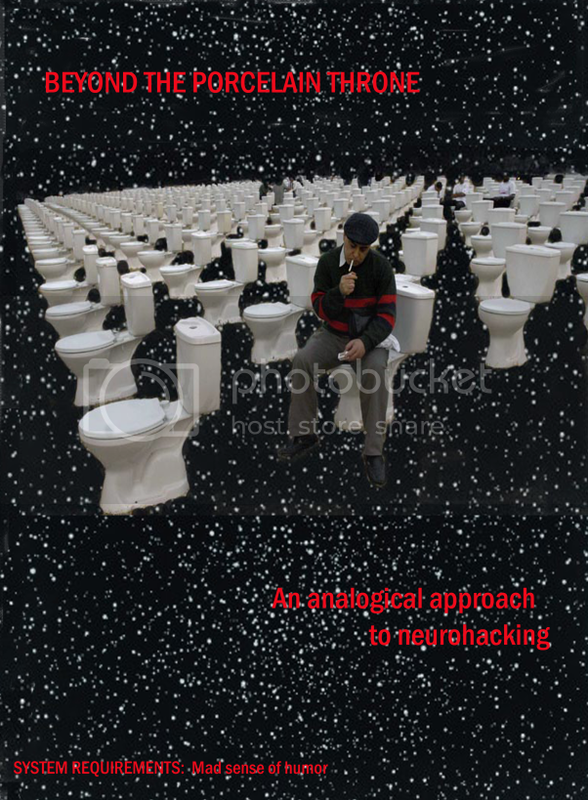 It’s important because we can only journey beyond the porcelain throne by working with entelechy, as opposed to against it.